Siddharth Panchal from Mumbai, B.E. - B.Tech Graduate. Siddharth Panchal is Electrical Engineer and currently have no work experience. PLC HARDWARE PLC PROGRAMMING PLC SCADA BASIC IN.. BASIC KNOWLEDGE OF.. BASIC C BASIC C & C++ MS ACCESS WINDOWS OPERATING SY..
are one of expert skill area's of Siddharth Panchal . 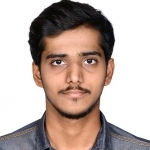 Siddharth Panchal is working in IT Hardware industry.